This was a commission for www.masterzdm.com for a player's rainbow colored dragon character, Yao Chi. Because I get so many questions about it: This artwork is not to be used or reproduced in any way without my express permission. It was created as as commission for someone else and as such is not my own character. Please respect the original character creator and my own wishes. Can you tell me , is that male or female rainbow dragon ? It looks perfectly color rainbow dragon and looks gorgeous or beautiful . Unlike or dislike rainbow dash for dragon version ! It was originally a commission for someone, it's a male character. WOW ! HOW YOU CAN TELL WHAT GENDER FOR A RAINBOW DRAGON ? Because the commissioner said it was male. Who/What is commissioner ? So you can tell , Rainbow dragon is a male ? awesome. i have a female rainbow dragon as a main character for a book i'm writing, but i have such a difficult time finding a color scheme that works for her. might i have your permission to use this as a reference? i would give full credit for it, of course. This isn't actually my own character, it was a commission and is someone else's intellectual property. So you can be inspired visually by it, but you probably shouldn't do what you're suggesting. i meant give you and the person who created full credit for letting me use it as reference. 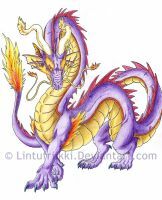 I feel like if I could have a dragon, it would look like this!!! Beautiful!!!!!!!!!!!!!!!!!!!!!!!!!! i have to say this is one of my absolute favorites simply because it is so damn COLORFUL! Yao Chi - God of peace of fortune. It is said to take form of a dragon with skin like that of a shining rainbow on a rainy/sunny day as it forms over a mountain like a beam of peace, this god is said to make them when he fly's but is impossible to see when flying, thus making it one of the rarest existing things this universe has to behold to the one and only human species ~ man kind itself.